Dubai, UAE, November 01, 2018: Europe’s Number 1* Home Appliances brand, Bosch, has opened its Flagship Store in Dubai’s Umm Suqeim area, in the heart of the city, in the presence of Mr. Andreas Wegner, Deputy Consul General Germany, Mr. Mohamed Hareb Al Otaiba, Group Chairman & CEO - MHAO Group, Ms Muzna Al Otaiba, Managing Director - Home Wide, and Mr.Tomas Alonso, BSH Home Appliances FZE CEO. Spread out over 360 square metres of built-up area, the new Bosch Home Appliances store makes room for a product display ranging over 150 different appliances and models, all designed by German engineers. The showroom follows a two-storey structure, with the ground floor dedicated to product showcases according to themes and categories. It hosts a welcome area, Brand Heritage and Innovation wall along with areas dedicated to kitchen inspiration, cooling, laundry, cooking and baking. The floor above makes room for the UAE’s newest cooking school with live cooking area and a Perfect Kitchen concept. “Our new flagship store strengthens our brand presence in the UAE market, and complements our existing network of outlets. This purpose-built space will help us deliver the quality, innovation, design intelligence and efficiency that Bosch stands for. Bosch prioritises innovation in the service of a healthy balanced life, and I look forward to people exploring the concept themselves in this beautiful new space,” said BSH Home Appliances FZE CEO Tomas Alonso. “We began this journey 38 years ago and it makes us proud, in providing total innovative solutions of German engineered home appliances. With an array of high performing and top of the line products, Homewide vision and goal is to enable customers to get the best products, services and experience which we have successfully achieved within the UAE. This venture enhances and emphasizes that customer experience and takes it to a whole new level. We are certain that this Bosch Flagship Store will prove to be one of the milestones and the epitome of high end customer delight,” said Mr. Mohamed Hareb Al Otaiba, Group Chairman & CEO - MHAO Group. 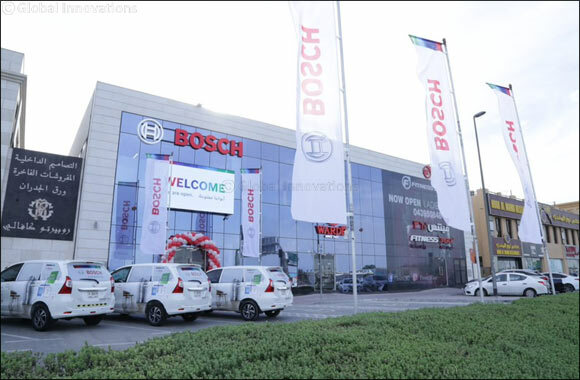 The showroom, operated by Bosch Home Appliances FZE’s UAE distributor and partner Homewide, also serves as a logistics hub for Bosch products UAE-wide. “Bosch products have proven to be very popular within UAE households thanks to the brand’s association with efficiency, high quality and great design. These products are created with the goal of making life noticeably easier, healthier and more balanced. We are proud to be the no. 1 distributor and exclusive partners of Bosch in the UAE. We are delighted to welcome customers to the first Bosch Flagship Store located on Umm Suqeim Street,” said Ms Muzna Al Otaiba, Managing Director- Home Wide.